Teacher Rachel DeKuiper leads her kindergarteners out of Meadow Ridge Elementary School in search of milkweed on a beautiful day. They walk hand-in-hand and two-by-two, as DeKuiper attentively guides them across a driveway and points out a butterfly. Her words are intentional. DeKuiper is using language taken from a new positive-behavior program being used by all Meadow Ridge teachers this year. Staying safe is a key concept. So is using the appropriate voice level for the proper place. This outing, DeKuiper tells her pupils, is level numbertwo: a whisper. Meadow Ridge’s 69 staff members are using common language to reinforce common expectations for the school’s 533 students. 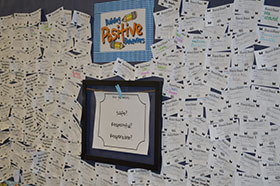 It’spart of a pilot program called Positive Behavior Interventions and Supports – PBIS for short – that aims to curtail negative behaviors by promoting positive ones. DeKuiper and other educators agree PBIS has made a big difference, from the noise level in the hallways to the way students treat each other. By teaching good behavior, they hope fewer students end up in the principal’s office, says Kirsten Myers, executive director of special services for Rockford Public Schools. “The concept is simple, but the effects are profound,” Myers says. Meadow Ridge, which includes about 150 pre-kindergarten students, was chosen as a pilot site for the district. Administrators plan to replicate it in Rockford’s eight other elementary schools next year. The program give students three basic expectations: be safe, responsible and respectful. It’s a mantra repeated by banners and posters throughout the building, complete with specific expectations for all settings — from the classroom (“use time wisely”) to the restroom (“give others privacy”). 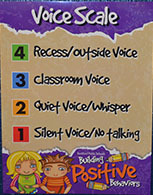 While the model has been used by other schools nationally, Rockford added a color-coded scale for voice levels. They range from level one – no talking – to level four, for outside recess. The levels are posted on every student’s desk. When students walk down the hall, their teachers hold up one finger. So do many students. When they pass Principal Blake Bowman, instead of saying “Hey Mr. Bowman!” they waggle a finger at him. “It’s like having a remote control for the classroom,” Bowman says. Proactive as the program is, faculty carefully monitor student behavior. There are forms to record incidents of bullying and other misbehavior, possible motivations for that behavior and the teachers’ disciplinary actions. After a fourth offense, students are referred to the principal. Though it is too early in the school year to derive meaningful comparisons, there have been no students suspended so far, according to Bowman. Last year there were 19, he said. But positive behavior is equally well tracked. Teachers who see students behaving responsibly and courteously mark their names on “Monarch Moment” slips, named after the school mascot. The slips are put in a jar, from which Bowman pulls out a dozen or more names a week for special prizes. Holly Osbeck, a school social worker, says the hallways are much quieter and student compliance much better this year. She sees students taking the behavior code seriously.